WESTMINSTER, Md., Sept. 10, 2011 – The kids’ 1,000-meter cross country run on Saturday was a new addition to the annual Green Terror XC Challenge at McDaniel College. This year, at least, it also provided the most dramatic finish – but not by much. Eleven-year-old Savannah O’Dell, daughter of first-year St. Mary’s College of Maryland coach Lynn O’Dell, managed to fend off a hard-charging Charlie Ferguson over the last 200 meters to earn the win in 4 minutes, 12.8 seconds. Ferguson, 9, of Westminster, crossed the line just 0.6 seconds later in 4:13.4. Big brother Jack Ferguson, 11, was third in 4:34 and Emma Kartalija, 12, of Westminster, was the second female to stop the clock with a time of 4:47.8. As the collegiate team buses began to arrive shortly before the start of the kids’ race, many runners’ eyes looked through the fog at a threatening sky. Rain was in the forecast – for the sixth day in a row on what already was a muddy, water-logged course. But Kartalija, who is no stranger to the trials of distance running (her Dad, Steve, is pretty good) brushed it off. The kids’ 1K was the closest – but only by a smidge. Tim Smith, a senior at Roanoke (Va.) College in Salem, edged Shenandoah University senior Josiah Renton by a mere 0.7 seconds in the men’s 3K race. Smith crossed the finish line in 9:34.1 to Renton’s 9:34.8. Tyler Muse (Harford CC) and Tony Clement (Williamsport Running Club) took third and fourth in 9:44.1 and 9:53.7, respectively, while Shenandoah’s Ryan Taylor rounded out the top five in 9:56.8. Roanoke’s A.J. Bernstein was sixth (9:57.1) followed by host McDaniel College runner Jake Zamostny (former Maryland state champ from South Carroll High School). Zamostny finished the 3K in 10:01.1. Zamostny also led the Green Terror in the men’s 5K. He placed third overall in 17:15. Smith, of Roanoke, doubled up to win both events. He covered 5,000 meters in 16:45.6, besting Tony Clement of the Williamsport Running Club (17:01.2). Steve Kartalia, running for the Baltimore-Washington Athletic Club, placed fourth overall in 17:25.4. Jill Krebs, running for the Green Terror Alumni team, paced a field of 54 runners over the 5,000-meter course in 20:32.9. 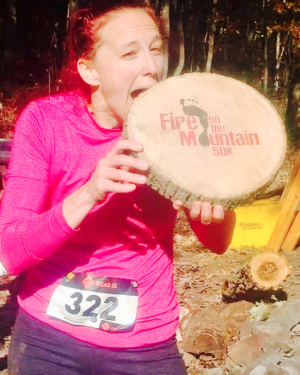 Only one other runner – Grace England of Roanoke College (20:48) – finished under 21 minutes. Emily Peoples, meanwhile, finished fourth overall to lead the current Green Terror squad to a first-place finish in the team standings with 34 points. St. Mary’s College of Maryland was second with 44 points. Hood College was third with 49 points, followed closely by Roanoke College (50) and Green Terror Alumni (59). Peoples (21:30.9) was followed by Missy Black (21:56.5), Becky Kaler (22:16.7) and Laura Shinn (23:31.5) rounded out McDaniel’s scoring top four – atypical from the standard approach of scoring a team’s top five runners on this short-course / long-course day. In the women’s 3K, Shenandoah’s Amy Smith led 65 others to the finish line in 11:42.4. Teammates Dorothy Earner and Roni Frye (12:06.9 and 12:18.6) helped the Hornets cruise to the team title with a meet-low 14 points. Shenandoah’s fourth and final scoring runner, Emily Hesse, took eighth overall in 12:48.3. Peoples again led McDaniel. She placed fourth overall in 12:31.5 to lead the Green Terror to a second-place finish among nine complete teams. Black again was second for the Green Terror. She stopped the clock in 12:58.4, good for ninth overall. All five events were timed by the Potomac Highlands Distance Club. Plenty of experts were on hand to assist, including Paul Burnside and volunteers Professor Steve Robertson, Troy Smith, Diana Pool, Phoebe and Pat.